A high credit score can be of great use in several ways. In addition to getting you a mortgage at a lower rate of interest, it can speed up the application process when you approach a bank for a loan. In fact, a FICO score in the 700s may even help you land your dream job or convince your prospective landlord that you will pay your rent on time. Unfortunately, many people have low credit scores and remain unaware that it is fairly simple to improve this situation. So, how can you raise your credit score in a short span of time? Your credit score is based on the credit report prepared by Equifax, Experian, and TransUnion. They receive a wide variety of data from various institutions that have financial dealings with you. These three credit bureaus furnish your information in reports to FICO, who calculates your score. Although it is likely that the information in all three reports is similar, errors can creep in. It is important to check each report and point out any mistake that you notice. Remember that you are entitled to a free report from each of the three national credit reporting bureaus every year. Use this facility and if you notice any errors, you should immediately initiate the process for asking the credit bureaus to make the necessary corrections. Equifax, Experian, and TransUnion have well-established procedures for dispute resolution. After you file a dispute, it will be necessary to keep track of the status so that you can take the issue to its logical conclusion. Getting corrections made on your credit report can result in an immediate hike in your credit score. Request your creditor to change its report to the credit bureau. If your credit report does not contain any errors you can still try to improve your score by attempting to change the information that goes into it. When you delay payment on, say, your auto loan, your lender reports this fact to the three credit bureaus. But it is possible to get them to change this by making a request. If you still owe money to the lender, write a letter putting up a proposal to pay, provided they change your status to “paid as agreed.” There is a good chance that the bank or financial institution will agree as they will be keen to get their money back. One precaution that you must take is to get the creditor to agree in writing to your proposal. If you do not take this step, you may pay and still fail to get the required change made in your credit report. If your record was prompt before you started delaying payments, you should inform the lender that they should take this into consideration. It is also important to convey the reason that led to your inability to continue making payments. Try and convince the bank to erase your debt or to make a goodwill adjustment. The time and effort that you spend on this are well worth it as it can result in an improved credit score. Don’t max out your cards. Using your credit cards up to the maximum limit is sure to lower your score. Doing this sends a message that you are desperate for cash and have spent beyond your means. Ideally, you should minimize the utilization level of your credit cards. The optimum is about 30%. Many people are unaware of the method that is used to calculate the utilization level. The credit bureau goes by the figure that the card issuer provides it. Some card issuers use the balance in your statement to determine your utilization level and not the amount that you are carrying forward to pay in subsequent months. As a result, even if you pay the entire balance every month, your utilization level may still be very high resulting in a drag on your credit score. What is the solution? There are only two ways to tackle this. The first is to simply restrict the use your card to 30% of its maximum limit. The other solution is to make regular payments on your card instead of waiting for your monthly statement. Check with your card issuer before you do this. They should accept your payments and report a correspondingly lower balance to the credit bureau. What if you don’t have a credit card? It is essential that you have at least one or two cards to build up a good credit history. Of course, you should use them only if you are sure that you will be able to pay on time. Using a card to make a purchase and then missing out on making a payment will result in a drop in your credit score. If you have poor credit or an inadequate credit record, your application for a card may be rejected. But there are ways to overcome this hurdle. One of the best solutions is to get a secured credit card. A secured credit card will give you a limit up to the amount that you deposit as a cash collateral with the card issuer. For example, you may have a deposit of $1,000 with the bank. If you are willing to offer this sum as security, your bank would issue you a secured credit card. You could then use your new card for making purchases up to the limit of deposit that you hold. Need greater credit? No problem. All you have to do is increase the size of our deposit. You may think that it makes little sense to get a credit limit against an equal amount of cash. But a secured credit card is useful as it may help to build your credit record. Remember that not every secured credit card issuer will report your payments to the credit bureaus. It is also possible that the bank flags your payments as being made against a secured credit card. This could serve as a deterrent to rebuilding credit and boosting your score. An alternate to a secured credit card. If you do not have the funds to deposit in a bank to enable them to issue you a secured credit card, there is another way out. You can become an authorized user on someone else’s credit card. Although this is a useful technique, it comes with its problems. Firstly, you have to find someone who is willing to add you as an authorized user onto their account. The person who does this assumes the responsibility for payment of the amounts that you spend. Due to this reason, you may find it difficult to find anyone who is willing to add you as an authorized user. If a parent with a high credit score adds you, it can help to hike your own score. But remember that the primary account holder’s record will influence your score too. So make sure that you become an authorized user of a card where the primary member has an impeccable credit record. The amounts that you spend as an authorized user will form part of your credit record. If you maintain a good payment history, it can help to build your score. While this seems like a no-brainer, a surprisingly large number of people with credit cards ignore this simple step. Very often, they have money available in their checking accounts, but forget to transfer the required sum to their credit card when a payment becomes due. If you are the forgetful type, set a reminder on your phone. Another way out is to auto-pay your credit card bills online. Find the system that suits you best, but don’t forget to pay promptly. This simple action on your part will make a large contribution to building up your credit score. Don’t take on new loans. Although gradually increasing your borrowing is not a problem, applying for several new credit cards simultaneously will definitely pull your credit score down. If you have taken on a new loan recently, let a sufficient amount of time elapse before borrowing again. Borrowing large amounts frequently can lead to another type of problem. You may not be in a position to meet all your financial commitments on time. If a large portion of your monthly income goes towards loan repayments how will you manage to pay for your day-to-day expenses? Another way to increase your credit score is to keep your old accounts active. If you have successfully paid off a loan over a period of time by making every payment on or before the due date, do not ask the credit bureau to remove it from your report. Old accounts serve to add to the length of your credit history, an important factor in arriving at your credit score. Similarly, if you have held the same credit card for a number of years, do not cancel it. Make it a practice to use it regularly. A credit card that was issued many years ago and is still in use will help to enhance your credit score. A high credit score has great utility. 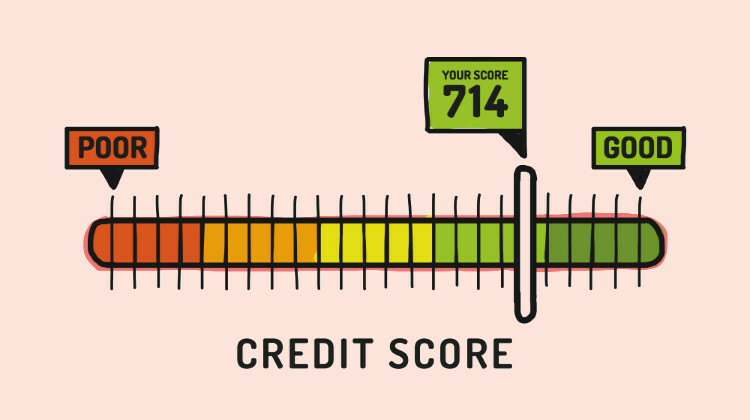 – Don’t underestimate how useful a FICO score in the 700+ range can be. A number of financial institutions use the three-digit score to decide on loan rates and eligibility. Taking the steps described above should help you in your endeavor to improve your score.